All of Mankind is a historic mural on Chicago’s near North Side. 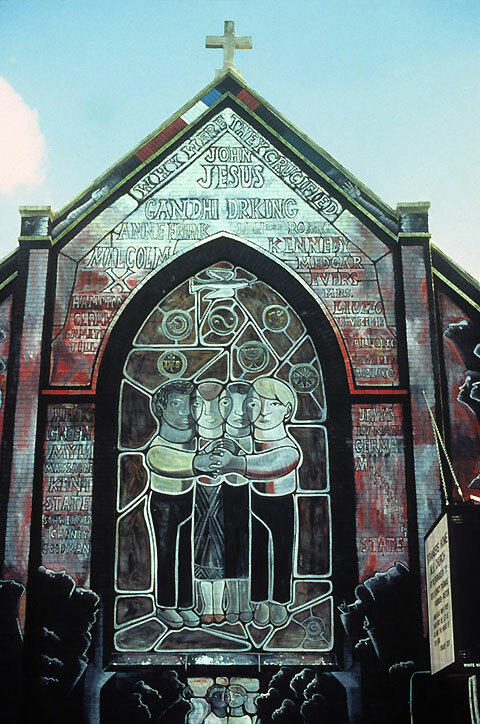 It was created in the 1970s by muralist William Walker, and covers the entire front of the North Side Stranger’s Home Missionary Baptist Church. 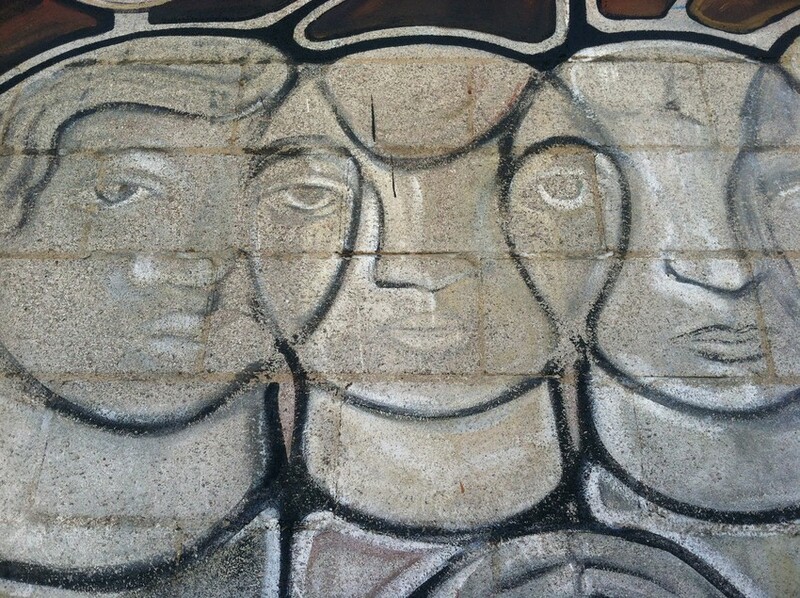 All of Mankind is considered a significant piece in the overall body of work of William Walker, who is one of the founders if not the founder of the community murals movement in Chicago. But despite that history the mural&apos;s been in limbo for years now, caught between the limited resources of the city and the tight budget of a small church congregation. The Chicago Public Art Group started a partial restoration recently, hoping a fresh coat of paint might jump-start other serious efforts to secure the mural&apos;s future. I got a nose-to-nose view of the mural, thanks to the man doing the restoration, contemporary muralist Bernard Williams. We headed 20 feet up on a scissor lift. And what a view! At the center of the image are four large interlocking figures, a motif Walker used in some of his other murals. They&apos;re grouped in front of what looks like a stained glass window. Above them are a number of religious symbols – Buddhist, Jewish, Christian and more. "It’s kind of nice to see fresh paint," Williams said. "I actually gave the wall kind of a sponge bath after wire brushing the loose sediment and dirt from the wall, sponged it down, let it dry and then I put a clear acrylic coating on the wall." The theme of this work is human unity – spiritual and political. Around the central figures is a list of names: "People like Fred Hampton, Malcolm X, Anne Frank, Ghandi," Williams said. "It really is kind of a bold statement in the sense that he really ... is attempting to voice this kind of quest for peace and unity, which was certainly a big issue in the &apos;70s, with racial strife and social struggles all over the place." That bold statement is now faded by time and weather. Despite its significance the mural wasn’t well-documented, so Williams is trying to figure out what a restoration would look like. "We think it was mostly browns and blacks and some kind of ochre-ish tones, but a lot of black, which is a little shocking for a stained glass window idea," he said. Not just the color, but the entire future of the mural is unclear. Stranger’s Home church stands on the grounds of the former Cabrini-Green housing project. In recent years those projects were torn down, under the Chicago Housing Authority’s Plan for Transformation. The church owns the property it’s on, but that’s all: The vacant land around it is either CHA or Park District property. Jon Pounds heads the Chicago Public Art Group, which is funding the partial restoration. He says that fact complicates things. "It’s very hard to raise money to restore a piece on the outside of a private building," Pounds said. He&apos;d like to see the church go to the Park District – and he says he’s not alone. "The Alderman has suggested that what he wants is for it to be a community center," he said. "There is no community center here in the area. That would be very appropriate." Ald. Walter Burnett Jr. oversees the 27th Ward, where the church is located. "The Park went in there and said this would cost a lot of money to repair it," Burnett said. "So they said it wasn’t worth it." But Burnett wants to see the mural preserved and thinks that can still happen, with or without the Park District. "There are many ways to skin a cat," he said. Another thing we’ve been trying to do is incorporate it as part of public housing over there, if and when we do the re-development of the property." That re-development is on hold, which may be the biggest problem facing the mural – inertia. At one point the family who owns the church was interested in selling. But the decline of the housing market and overall economy brought those plans to a halt. Meanwhile Burnett can’t get anyone at the city – the Park District, the CHA, the Department of Housing and Economic Development – to act. Still Burnett thinks the status quo is fine, as long as the church doesn’t make a move. "When they were trying to sell it, I think that’s what concerned everyone, the preservationists, myself, as far as what was going to happen to the mural," he said. "I think as long as they stay there, the mural will be okay." Church board member Creola Thomas – she’s also the sister of and assistant to church Pastor Christmas Trotter – says there are no plans to move. "That was an option, it was explored and at this point in time, I can only tell you that we’re at the church, we have regular service. We’re there, we’re trying to survive," Thomas said with a laugh. She said the church is focused on attracting new members – she says the congregation currently numbers around 150, and about 50 to 70 people show up for Sunday services. They’re also continuing structural repairs – they replaced the roof but need a new floor and more. The church doesn’t have the money to restore the mural on its own. And if the CHA does find a developer, the church may have to sell – or be bought out. If the developer comes in and the church’s asking price is too high, Ald. Burnett says he would consider eminent domain. "I think they feel like they’re in a rich area and think it&apos;s probably worth a lot more money than what it may actually appraise for today," Burnett said. "And they may not want to sell. So (if) we do eminent domain on them that could be very emotional. You know, they&apos;re a family church ... so it&apos;s sensitive I think." 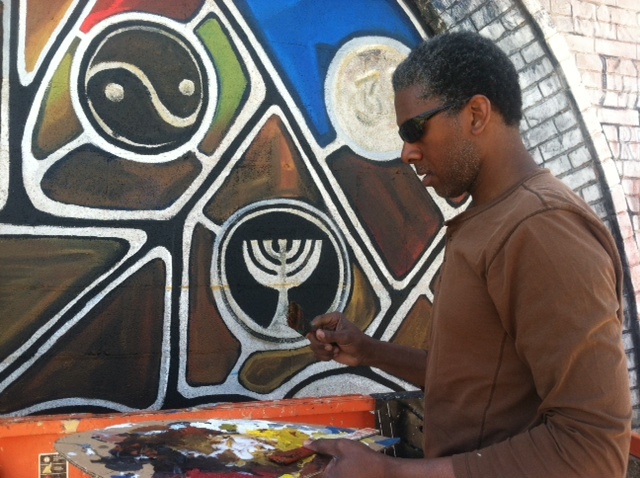 Back at the church, muralist Bernard Williams is focused on the job at hand, not the politics on the ground. Still he thinks the larger political context – at least of &apos;70s era Chicago – contributes to the lasting value of William Walker’s mural. "You know his work was a very political, public work that did not skirt the issues of the day," Williams said. "It’s the history, you know it’s our history." Right now all the interested parties aren’t so much skirting the issues as stuck. Williams hopes that restoring the mural, even partially, might get something moving – and secure the future of the mural.